Deception, duplication and The Rescue (1965) | Randomwhoness: a Doctor Who blog by Johnny Spandrell. Sampling stories in random order. Carole Ann left the show because her character didn’t develop beyond a screaming teenage girl, as she was promised it would. But given the chance to make changes to the key cast, the Doctor Who production team chose to stick to type, and replace Susan immediately with another teenage girl. And indeed one without parents and one with advanced knowledge of the future. Vicki’s almost as unearthly as Susan. No wonder Newman couldn’t shake the image of Susan from his mind; the production team were wanting Susan mark II. Later on in this season, there’s even a moment one of the Daleks’ killer robots is defeated when it can’t tell that Vicki is a different person to Susan. But Vicki is different to Susan, mainly thanks to Maureen O’Brien’s attempts to bring depth to her character (not something, I suspect, the series’ writers were much worried about). She’s more biting than Susan and more likely to voice a different opinion to the other three leads. There’s a nice moment in The Romans where she’s following the Doctor round in typical companion style, then she sudden says “See you later”. She’s off to follow a lead of her own. William Hartnell’s authoritarian Doctor looks shocked. It’s like she’s still learning how companions are meant to behave. She also grows up over the course of her time on board the Ship. In a sense, this is just another copy of what happens to Susan: she stays with the Doctor for a year, grows up and is married off. But I’d suggest the change in Vicki is more distinct. If you look at The Time Meddler, she’s a very different character to the one in The Rescue. It’s partly a side effect of the series going from three companions to two, a change which broke up the faux family unit of Doctor, Ian, Barbara and teenage girl. It gives Vicki a bigger slice of the action and her age and experience is subtly nudged up to assist. In The Rescue, however, she’s is clearly a child. Her fellow castaway Bennett (Ray Barrett, an actor familiar from loads on appearances in Australian film and TV) says so. They are apparently the two survivors of the crew of a crashed spaceship, killed in a massacre by the inhabitants of this classically named planet, Dido. Since then, Bennett has been confined to quarters by a gammy leg, and both have been menaced by a spiked, tusked and clawed monster called Koquillion. Now, it’s hardly a spoiler (after all this story’s now 50 years old) to reveal that Koquillion is Bennett in disguise. It’s one of the first things you learn in Who 101, a basic fact which most fans knew long before we read the Target novelization in 1987, let alone watched the story on VHS in 1994. The Rescue comes to us spoiled, so we’ll never know how obvious that twist was. 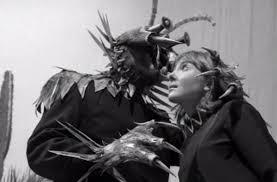 Nor will we know how surprised viewers who dismissed Koquillion as a man dressed up in a monster costume were, when he was revealed to be a man dressed up in a monster costume. I suspect that writer David Whitaker’s sleight of hand probably worked. Bennett is kept sufficiently in the background and his lameness so well established that the possibility that Koquillion is anything but a separate person would have crossed the minds of only the most forensic of viewers. The Doctor is clearly not fooled; he knows the inhabitants of Dido from a previous visit and so knows the spikes and claws described by his companions – he meets neither Bennett nor Koquillion until the story’s climax – are ceremonial robes. But he keeps this information to himself, even to the point of confronting the murderous villain solo, which seems like an unnecessarily risky strategy, but one which maintains the plot’s central mystery. It leads to a terrific final scene between the Doctor and Bennett, with Hartnell and Barrett acting their socks off. But ultimately, it’s an unsatisfying climax, because it leaves out our central character Vicki. It is Vicki whose story we’ve followed since scene 1. It is Vicki upon whom Bennett’s most egregious crimes have been visited: the murder of her father, incarceration and terrorisation. By rights, it’s she who should get the chance to confront her tormentor, perhaps to even push him over the cliff over which he tumbles at story’s end. Instead, she’s kept off stage and it’s left to the Doctor to recount to her how Bennett met his match. And the reason why she’s sidelined is not just because the Doctor’s our story’s hero. It’s also because she’s a child and Doctor Who keeps children out of harm’s way. Not all children’s fiction is like this. Long before Harry Potter, C.S. Lewis’ Narnia series featured children facing up to villains and engaging in terrible danger. But not 60s Who. Like Susan, Vicki will be forever kept from the main game. And in a way, the ease with which the Doctor solves the mystery of Koquillion is another indicator of Vicki’s childhood. Bennett’s plan, it seems, would not have stood up to an adult’s scrutiny. In needed the credulity of a child to succeed. O’Brien, like her predecessor, found the role of junior companion unsatisfying and she was unceremoniously dumped at the beginning of the show’s third year. The series experimented briefly with companions who were Trojan handmaidens and Space Security Agents. But then they reverted to type and introduced another teenage girl, Dodo Chaplet. She even had short dark hair. Makes you wonder… why didn’t they just get Carole Ann Ford back? LINK to The Time of Angels/Flesh and Stone. In each, the villains are defeated by falling to their deaths. NEXT TIME: It’s a case of the flaming oopizootics when The Talons of Weng-Chiang shred our fleeeeessssh!